Ok, so, Santa has just finished placing all of the Christmas gifts under the tree, it's now 3:00 am, the kids are gonna be awake in about 3 hours, and Mom and Dad are just going to bed. Sound familiar? Does anyone feel like getting up and baking cinnamon rolls? Probably not. Fortunately, I have the answer for you! Why not make them in a crock pot?!!?? Even if you decide not to make this for Christmas morning, this one is definitely a keeper. It's REALLY delicious and comforting and warm and cozy. LOVE it. Spray your crock with cooking spray. Place a layer of cinnamon roll pieces to cover the bottom of a 6 qt slow cooker. (Reserve icing packets). Beat eggs, cream, maple syrup, vanilla and spices until blended well. Pour evenly over the rolls in the slow cooker. Place remaining roll pieces on top and spoon one packet of icing evenly over rolls. Cover and cook on low for 2½ to 3 hours or until sides are golden and rolls are set. Drizzle remaining icing over top and serve warm. Be sure to spray the crock pot before you make it. You'll be glad you did! It's delicious as written, but I think it needs to be just a tad sweeter. So I would add a little extra maple syrup and I definitely wanted MORE of the icing on top. The next time I make it, I think I might whip up some sort of cream cheese glaze to pour over the top. If you have a cream cheese glaze recipe, please share it with me! Thanx! I first saw this recipe on Trisha Yearwood's cooking show. Frankly, I don't know anyone who doesn't like cookie dough, so I knew I would have to try it. 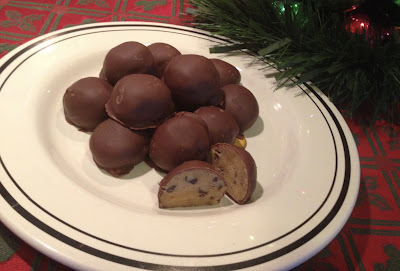 Then when I went to look up the recipe, I found several different cookie dough truffle variations from several different websites. Hmm... do I stick with TY's recipe or try one of the others??? They all look pretty similar. I wonder what the difference is. I noticed that all the recipes had all the basic cookie ingredients but they all had something else instead of adding a raw egg (which is the reason everyone says not to eat regular cookie dough). So I decided to try a recipe that adds sweetened condensed milk instead of the egg. It was good, but you could definitely taste the creamy flavor of the milk. As much as I love sweetened condensed milk, it was not what I was hoping for in a cookie dough. So I went back to TY's recipe, which uses applesauce instead of the egg. THIS was the one. See? I should have just stayed with my original plan and made this one in the first place! The applesauce gives you the moisture and texture of regular cookie dough, but it doesn't change the flavor. Delicious!! I loved them so much, I had to make another batch! They're the perfect treat for gift giving or entertaining around the holidays. I'm sure your family and friends will love them too! In an electric mixer, beat the butter, granulated sugar, brown sugar, applesauce and vanilla together until smooth. Sift the flour, baking soda and salt together, and with the mixer running, slowly add to the butter mixture. Mix in the chocolate chips. Scoop out the batter using a teaspoon or mini ice cream scoop and roll it into balls. Place the dough balls about an inch apart on a baking sheet lined with parchment or wax paper and transfer them to the freezer for 30 minutes to let the dough set up. While the dough is chilling, melt the chocolate wafers in a double boiler or a metal bowl over a pan of simmering but not boiling water. Remove the chilled dough balls from the freezer. Using two spoons, dip the balls one at a time in the melted chocolate, rolling them to coat fully. Returned the dough balls to the paper-lined baking sheet and refrigerate until set, about 30 minutes. Store in the fridge for up to 2 weeks. As you're making these, keep in mind that you really want to make them very small. Basically you want to make them small enough to be able to just pop one in your mouth. I've found that most times, especially at a holiday party, people just want a taste, not a big honkin' CHUNK of cookie dough that requires several bites. If they want more, they can just have another one! Or three! TY's recipe uses dipping chocolate mixed with almond bark for the dipping, but I just used the dipping chocolate, as I've listed above. For a little variation, try dipping the truffles in white chocolate or milk chocolate instead of the semisweet. For a little extra touch, drizzle each dipped truffle with another kind of chocolate in a contrasting color. Drizzle a semisweet dipped truffle with a little white chocolate over the top. Or vice versa! Here's a recipe that I got from my niece, Kim, about a million years ago when she made them for a family get together. Like I always say, I have no idea where she got the recipe, and since she the one who gave it to me, then she's the one who gets the credit for it. To be honest, I can't even remember what the occasion was, but I do remember that everyone couldn't stop eating them! Eh, what can I say, it was quite a while ago. Don't judge me. But omg wait'll you taste them! They're chewy and delicious and they're everything you'd want a brown sugar cookie to be. And the brown butter gives it a nutty flavor that is just HEAVEN. Definitely add them to your cookie repertoire! They're the perfect addition to any holiday cookie tray. But you don't have to wait until the holidays! Make 'em any time! Melt the butter in a skillet over medium heat. Allow to simmer until it starts to turn an amber color and smell nutty and fragrant. Remove from the heat to a separate bowl. Allow to cool for 15 minutes. In the bowl of a stand mixer fitted with a paddle attachment, combine the browned butter and brown sugar until well-blended. In a separate bowl, whisk together the flour, baking soda, baking powder, and salt. Set aside. Add the egg and egg yolk to the butter/sugar mixture one at a time, scraping down the sides after each addition. Mix in the vanilla. Mix the flour mix into the cookie dough, stirring until just combined. In a small bowl, combine the sugar and brown sugar. Scoop the cookie dough into balls using a 1 1/2 tbsp cookie scoop (or just scoop it into rounded tbs). Roll in the sugar mix and place on the prepared baking sheet. Repeat with remaining cookie dough, leaving 2 inches between each dough ball on the baking sheet. Bake for 10-12 minutes or until starting to set around the edges. Allow to cool before serving. Definitely be sure to use the parchment paper whenever you bake cookies. When the cookies come out of the oven, you can just slide the whole sheet off the try and onto the counter for the cookies to cool, and you can have another one ready to slide right onto the tray and back into the oven it goes. It really makes things move right along, especially if you have lots of cookies to bake! Here's a quick and easy dessert that is extremely easy to make and is HUGE on flavor. I made thiese for a family event a while ago and everyone LOVED them! The recipe is actually Trisha Yearwood's Skillet Almond Shortbread, but I decided change the amounts in order to make them in a 9x13 pan and cut them into squares, instead of doing them in a skillet and slicing it like a pie. Worked perfectly! They're soft and chewy, and just the thing for a party or just to have with a cup of tea. Add these to your dessert tray for your next holiday gathering, and I bet you there won't be any left before long! And one other thing, I know I always say how great each recipe is, but seriously, this is one of the BEST recipes I've tried in quite a long time and will now be the standard against which all other shortbreads will be compared. It's just that good. DEFINITELY give it a try! Line the pan with parchment paper with enough extra to hang over the sides. Spray the parchment paper with cooking spray. In a large mixing bowl, stir 2 1/4 cups of the sugar into the melted butter. Beat in the eggs one at a time. Sift the flour and salt onto the batter. Add the almond extract and stir well. Pour the batter into the prepared pan. Top with sliced almonds and the remaining 2 tablespoons sugar. Bake until slightly brown on top, about 35 minutes. Cool completely. Use the parchment paper as a sling to lift the shortbread from the pan in one piece. Cut into squares. I always use this parchment paper method any time I ever make any kind of bars or squares in a 9x13 pan. It makes it easier to remove from the pan, it saves your pan from damage caused by your knives, and it also allows you to make nice even perfect cuts instead of trying to hack away at it inside the pan. Normally when I use a 9x13 pan, I would cut it into 24 squares. but I wanted them to be more like little cookies, so I decided to cut it into 32. Looking for a quick and easy dessert? 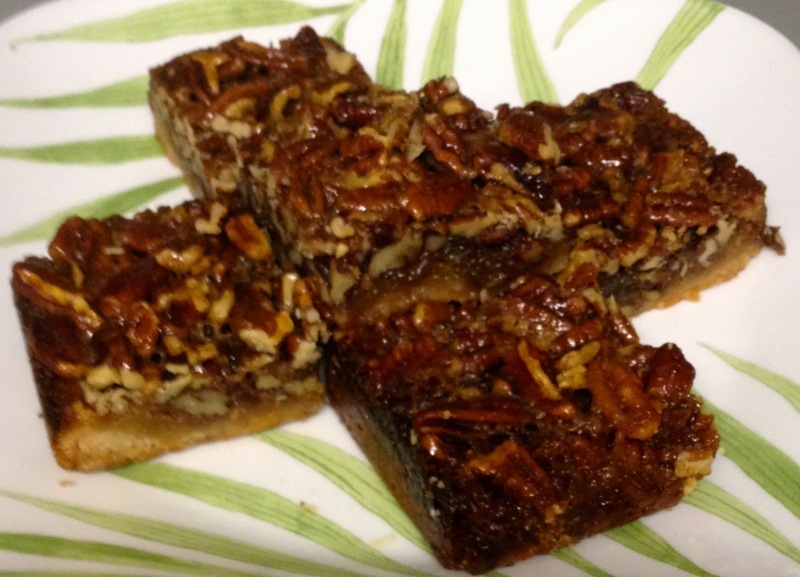 How about a rich and chewy square that isn't too sweet and has just a touch of spice? If this sounds like a good idea, then this is the perfect dessert for you. To be honest, I was originally looking for something along the lines of a brownie, well, more of a blondie, but I think this has more of a sweet potato pie vibe. And that's exactly what makes it perfect for your next holiday get together! Give them a try and your guests will love them. I'm sure you will too! In a large bowl, mix together the mashed sweet potato, oil, both sugars, the milk and the vanilla extract. Sift in the flour along with the baking powder and the pumpkin pie spice. Mix the batter just until the dry ingredients are moist, then fold in the chips and craisins. Pour the batter into a well-greased or buttered 8x8 baking pan. Bake for 30 minutes. Cool completely or chill before removing from pan and cutting into squares. To make this is a 9x13 pan, just double it and bake it for a little longer. It's not exactly the same, but the math is close enough that it will work. To insure that the squares won't stick to the pan, spray your pan with cooking spray, line it with parchment paper, then spray it again. Then after it's baked and chilled, lift the entire batch out of the pan at once, and use a big knife to make perfectly clean cuts. SO much easier and it saves your pan from being scratched! 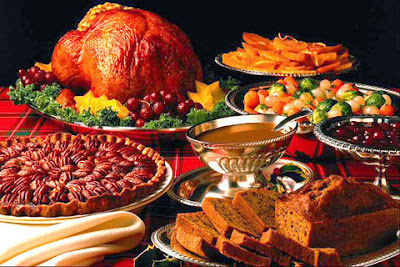 Many people ask me for ideas and hints and tips and suggestions when it comes to planning and cooking for Thanksgiving. Just as I do every year, I've added some new recipes to my Thanksgiving page. I must say, this is becoming quite a list! In addition to all the fabulous recipes, there are helpful tips about menu planning and methods of cooking your turkey, as well as what to do if something goes wrong. It's probably not a bad idea to bookmark the page! This way you'll have it handy and ready to refer to whenever you need it as you plan your holiday menu. Yes, I know I have a several recipes for the same items (potatoes, sweet potatoes, corn, etc). But don't you think it's nice to have a few different options? I also have a few recipes that are not necessarily seasonal, but would be great for your Thanksgiving feast. (summer squash anyone?) Feel free to browse through them! Hopefully they'll help you plan your Thanksgiving menu and maybe they'll inspire you to try something that you've never attempted. Of course, I'm always here for culinary tech support. Just email me! Oh, and don't forget to let me know how it goes! Have Fun! I was looking for Thanksgiving side dish recipes and I found several recipes for acorn squash. I had never cooked an acorn squash, so I went with it. Some were pureed or diced, some were glazed or stuffed. Then I found Paula Deen's recipe where they are roasted with maple syrup, butter, and brown sugar. Clearly, this was the recipe to try, don't you think??? I mean, seriously, doesn't that sound AMAZING??? It's super easy to make, can be done in advance, and OMG just wait until you taste it! It sort of has a glazed sweet potato sort of a vibe. And how convenient is it that each person gets his own little portion? I love that. If you're looking for something that looks elegant and impressive, but is absurdly easy to make, then this is the perfect Thanksgiving side dish for you. It's also really economical because one little acorn squash is good for four servings. Perfect! So good. You should definitely try it. Scoop the seeds and stringy pulp out of the squash cavities and discard. In a small mixing bowl, combine the brown sugar, butter, syrup and salt and pepper, to taste. Brush the squash cavities and the cut sides of the squash with the butter mixture and place them on a baking sheet, cut side up. Bake in the preheated oven for about 1 hour until the squash is tender when pierced with a fork. Brush with a little more of the brown sugar maple glaze. Serve one quarter per person. Don't forget the salt and pepper! It gives it sort of a salted caramel kind of vibe. Just one taste of the glaze, and you'll want to put it on everything! Not even kidding! When I baked the squash, I was worried that the brown sugar would drip down onto the tray and burn. So I poured a little water onto the tray to keep that from happening. Worked very well, I must say! The original recipe said to serve one HALF per person instead of one quarter, I think an entire half of a squash is far too large to put on your dinner plate. So I decided to cut them into quarters instead. If you like a gooey sweet classic Pecan Pie, you'll love these little squares of awesomeness. They have a very similar buttery rich flavor as the pie, but sometimes it's more convenient to have something that doesn't need plates and forks in order to serve it. As my sister Cathy would say "We need some sort of picky-uppy dessert", and that's exactly what this is. And if you're making them for a holiday meal, you might already have several other kinds of pie, and this will add a little variety to your dessert table. I made them so long ago, I can't even remember where I got the recipe. I know I tried several different versions, probably stemming from Ina's. (Her recipe makes a TON, so I remember wanting to scale it down a bit). This is such a simple basic recipe, anyone can do it! While the crust is baking, you just stir the filling ingredients together and you're good to go. Easy! So, even if you're not making them for a holiday meal, keep these squares in mind the next time you need a picky-uppy dessert. Your family will love you for it! Place all crust ingredients in a food processor and pulse until it comes together into a dough. Press into 9x13 pan lined with parchment paper. Prick all over with a fork (to keep the crust from puffing up) and chill for 15 minutes. Place in a 350ºF oven for 15 minutes. While it's baking, make the filling. Stir together all filling ingredients. Pour over hot crust. Bake for another 20-25 minutes. Let cool completely or chill before cutting into squares. For an extra decorative touch, after cutting them into squares, dip just one edge of each square into melted chocolate chips. You could also drizzle each one with a little melted white and/or milk chocolate chips. Just place them on a tray until the chocolate is set before serving. Be sure to leave a little excess parchment paper hanging over the sides of the pan. Then when it's finished baking and cooling, you can use the paper as a sling to lift the entire batch out of the pan in one piece. Now you can use a big knife to make perfect cuts without ruining your pan! Ok here's one for the cooking novice. This recipe requires absolutely no cooking skills at all. If you can boil water, you can make this recipe! You just throw everything into a pot and let it simmer. Couldn't be any easier! Now I have to tell you, when I first saw the recipe (on a website called Realsimple.com) I was a little unsure of how it would taste. Bourbon? With cranberries? But then I figured, Why not? So I gave it a try. It's absolutely delish! And actually, it's not as bourbon-y as I was expecting. To be quite honest, I'm not even sure if you would know that there's any bourbon in it unless you knew that there's any bourbon in it. Know what I mean? It's really subtle. The bourbon adds just a very slight note under the tartness of the cranberries. It's really quite nice, but I don't want you to go into it thinking it tastes like you just did a shot. Savvy? Whenever I try a new recipe, I always ask myself "would you make this again?" to help me decide if I like it or not. And this time the answer is an absolute YES. It's absurdly simple to make, it's delicious, it's quick, and it's SO much better than anything you can get out of a can. Place all ingredients in a saucepan over low/medium heat. Simmer, stirring occasionally, until the cranberries begin to burst and the sauce thickens, 20 to 25 minutes. Let cool before serving. If your cranberries are frozen, there's no need to thaw. Just go right from the freezer to the pot! The recipe is listed as I found it, but I think I'll add a little more sugar and a little more bourbon the next time I make it. Maybe I'll up the sugar to 1 Cup, and up the bourbon to 1/3 Cup. This will definitely thicken as it cools. There is so much natural pectin in the cranberries that you don't need to add anything else. If you'd like it to be a little more soupy, just cook it for about 15 minutes instead of 20-25. Don't just make this recipe on Thanksgiving. Make it any time you serve roasted chicken or pork! Buy several bags of cranberries while they're available and then keep them in the freezer for months! If you're not a drinker and you don't want to buy a big bottle of bourbon, just buy one of the little small bottles, (you know, like they serve on an airplane?). Each one is exactly 1/4 cup! It makes a very small batch, which is perfect for a small party. If you're cooking for a big gang, just double it or triple it! I first saw these crispy little pieces of peanut butter heaven on a TV show called Unique Sweets. The show highlights different dessert items from all over the country. This was from a place in NY called Baked. They're sort of like an amped up version of a rice krispie treat. SO good, and really simple to make too! My friend, Sean, was hanging out with me one afternoon as I was making them and so I asked him if he would mind being a taste tester for me. Of course, he did and he loved them! Actually, I think "obscenely delicious" was the phrase he used. I must say I have to agree with him! They're really THAT good! They're more crunchy than the usual rice krispie treat, and then they have this SINFUL layer of creamy rich peanut butter, almost like fudge. Then, as if that's not enough, there's a layer of chocolate icing, sort of like a ganache on the top. It all definitely falls into the category of "how can this not be good?" REALLY rich and decadent, but SO addictive at the same time. I didn't make them exactly as the original recipe directed. I just fiddled a little bit with the amounts of each ingredient, but the technique was all the same. The original recipe was for an 8x8 square pan and I wanted to use a 9x13 pan, so I just changed a few things. I think it worked pretty well!!! Make these for your next party! I betcha everyone will devour them! Put the cereal in a large bowl and set aside. Lightly spray a paper towel with nonstick cooking spray and use it to rub the bottom and sides of an 9x13 baking pan. Into a small saucepan, pour 1/2 cup water. Gently add the sugar and corn syrup (do not let any sugar or syrup get on the sides of the pan) and use a small wooden spoon to stir the mixture until just combined. Put a candy thermometer in the saucepan. Cook over medium-high heat and bring to a boil. Cook until the mixture reaches the soft-ball stage, 235F. Remove from the heat, stir in the butter and pour the mixture over the cereal. Working quickly, stir until the cereal is thoroughly coated, and then pour it into the prepared pan. Using your hands, press the mixture into the bottom of the pan (do not press up the sides). Let it cool to room temperature while you make the next layer. In a large nonreactive metal bowl, stir together the chocolate and the peanut butter. Set the bowl over a saucepan of simmering water and heat, stirring with a rubber spatula until the mixture is smooth. Remove the bowl from the pan and stir for about 30 seconds to cool slightly. Pour the mixture over the cooled crispy layer. Put the pan in the refrigerator until the top layer hardens, about an hour. In a large nonreactive metal bowl, combine the chocolate, corn syrup and butter. Set the bowl over a saucepan of simmering water and heat, stirring with a rubber spatula, until the mixture is completely smooth. Remove the bowl from the pan and stir for 30 seconds to cool slightly. Pour the mixture over the chilled milk chocolate peanut butter layer and spread into an even layer. Put the pan in the refrigerator until the topping hardens, about an hour. Cut into 24 even squares and serve. The bars can be stored in the refrigerator, covered tightly, for up to 4 days. Instead of spraying a paper towel and greasing the pan, I sprayed the pan with nonstick spray, then lined it with parchment paper, letting some hang over the sides, then sprayed it again. Then after it was chilled it was easy to just lift the whole batch out of the pan in one piece, using the parchment paper as a sling. I always use this method whenever I make any kind of bars because it's easy to make perfect cuts with a big knife, and it doesn't ruin the pan. Simple, right? I sliced them into 24 bars, just as I would do with brownies, but you could easily stretch them a little further by cutting them into smaller squares. They're rich enough that a smaller serving would still work. Here's an easy throw together dessert that only uses a few ingredients and is AMAZINGLY delicious. I recently had the gang over for dinner, and I decided to make this for my good friend, Lea, who loves anything and everything lemon. Not only was it a snap to make, but it was also convenient because it's a total do-ahead. I made it the night before the event, but I could have easily made it two or even three days in advance. If I were going to do that, I would just cover it, and then add the whipped cream and berries or any other garnish just before serving it. It's light and fluffy and sweet and tangy and fresh and rich, all at the same time. Now, I know it's called an icebox pie, which means there's supposed to be no baking involved. I like to bake the crust because it adds a sort of toasty flavor, but you really don't have to. You can make the crust as directed and then instead of baking it, just let it chill in the fridge for a while before you pour in the filling. Then it would TRULY be an icebox pie! Easy! So if you don't consider yourself to be a baker, then this is the dessert for you. If you can mix up a few ingredients, you can make it! Place Oreos and sugar in a food processor fitted with a metal blade and process until the cookies are crushed to crumbs. Add melted butter and pulse until well combined. Press buttered crumbs evenly and firmly into a deep Pyrex pie plate. Bake crust for about 10-15 minutes. Remove from oven. Meanwhile, combine all filling ingredients with a mixer until smooth. Pour into cooled crust and smooth out the top. Refrigerate at least 2 hours or overnight. Garnish with fresh lemon slices, berries, whipped cream, and/or fresh mint leaves. You can use any kind of cookies for the crust, graham crackers, anything you like. Or you can simply purchase a ready made graham cracker crust. If you'd like an extra burst of lemony flavor, add some extra lemon zest! Pour the filling into the crust as directed, then put a few dollops of purchased or home made lemon curd here and there on top of the filling. Then use a knife to swirl the curd through the filling and chill as usual. Easy!! I was recently texting with my friend, Lea, about chicken salad. (Yes, many of our texts are about food!) Anyway, she mentioned that she loves my chicken salad. I told her that, come to think of it, I never really make it the same way. Sometimes I'll add lemon and basil, sometimes I'll add diced celery, diced pickles, and chopped scallions. This time, I decided to try something new, and I added a few extra flavors, just to see where it would go. I figured since I love pepperoni and cheese with mustard, why not throw it into a chicken salad? I LOVE how it turned out! The sharpness of the cheddar cheese, the spice of the pepperoni, and the sweet crunch of the red bell pepper all balance perfectly! And since I'm currently choosing to restrict carbs from my diet, this one is right up my alley. I rolled it up with a little shredded lettuce in a low carb wrap and boom, lunch was ready! Hope you'll give this one a try! Pull all the meat from the chicken bones and dice or shred it into small pieces. Finely dice the bell pepper, pepperoni and cheddar cheese. Add about 3/4 cup mayonnaise and 3 or 4 tbs mustard (or to taste). Stir all together. Season with S&P. That's it! The amounts of the ingredients are all to taste. If you like a lot of something, add a lot! This is a great way to use up leftover chicken. You could also use poached chicken breasts, if you like. Be sure to add the bell pepper. You really need that crunch of freshness to cut through the heaviness of the cheese, mayo, and pepperoni. You can use shredded cheddar, if you like, but I went with small dice instead, just as I would do when serving pepperoni and cheese. Here's a quick and easy biscuit recipe which was posted on FB by my friend Lauren. I'm not even sure whose recipe it is, but like I always say, since she's the one who gave it to me, she's the one who gets the credit! They're super easy to make and all you need is just 4 simple ingredients. Perfect! And surprisingly, they don't taste sweet like the 7 Up. They just taste like delicious biscuits to serve with any country gravy or dinner you happen to be whipping up. Make 'em for your next country breakfast or dinner and watch everyone devour them. Betcha there won't be any left! Mix Bisquick, sour cream and 7 up. Dough will be very soft - don't worry. Knead and fold dough until coated with your baking mix. Pat dough out and cut biscuits using a round biscuit / cookie cutter. Melt butter in bottom of cookie sheet pan or 9x13 casserole dish. Place biscuits on top of melted butter and bake @ 425 degrees for 12-15 minutes or until brown. Since they bake in a rectangular pan, I didn't see the point in using a round biscuit cutter. Then you'd have the scraps of biscuit dough that you'd have to reroll and cut, etc. I just figured I'd form the dough into a rectangle, cut it into squares and then fit them perfectly into the pan. Doesn't that make more sense??? Who's with me?? If you know me, you know that I love to cook for my friends. I love to assemble a big group at my apt, plan a menu according to whatever theme we've chosen, and then show everyone how I made each thing. I also love it when everyone gets in on the cooking. It's always a good time! Recently, we decided to have a Southern Food night. It was awesome! In addition to my famous Baked Beans, we had Fried Confetti Corn, Cheesy Tater Tot Casserole (without the beef), and of course, Classic Fried Chicken. We added some 7 Up Biscuits along with The Best Carrots and Green Beans Ever and there, Ladies and Gentlemen, was a pretty amazing home cooked southern chicken dinner. To be quite honest, I had never cooked regular classic fried chicken. I know, I know, crazy, right? One would think that I would have cooked something so classic at some point in my life, but nope, never did! I must say, I think it was pretty slammin'! I did some searching to see which recipe I'd try, and (as you can imagine), I found a million versions. I went with Ree Drummond's recipe because that seemed to be pretty close to what I had in mind for a Classic Fried Chicken recipe. It was crispy and tender and fabulous and comforting and flavorful all at the same time. I think it'll probably be my go-to recipe the next time I decide to have another fried chicken night. Yes, of course, it's not the best idea to eat fried anything all the time, but everyone once in a while, a little comfort is a good thing! Thoroughly rinse the chicken, then cover all the pieces with 4 cups buttermilk and soak in the fridge overnight or up to 24 hours. When you're ready to fry the chicken, remove the bowl from the fridge and let it sit on the counter for 30 minutes, just to take off the chill. In the meantime, preheat the oven to 360 degrees F and mix up the breading. Place the flour, seasoned salt, paprika, pepper, thyme and cayenne (extra cayenne if you like heat) in a very large bowl. Stir together well. In a small bowl, combine the 1/4 cup buttermilk and the milk. Pour the milk mixture into the flour and, with a fork, gradually mix until there are little lumps throughout. This will adhere to the chicken and make for a crispier breading. If necessary, add a little more flour or milk to the bowl in order to make it slightly lumpy. Heat 1 1/2 to 2 inches of oil in a deep skillet over medium-high heat until a thermometer reaches 365 degrees F. Lower the heat slightly, if necessary, to keep the oil from getting hotter. Add the chicken to the oil 3 or 4 pieces at a time. Make sure they aren't sticking together, then cover the pan and fry for 5 to 7 minutes, checking occasionally to make sure the chicken isn't getting too brown. Turn the pieces over, cover again, and cook 3 to 5 minutes more. All the while, monitor the temperature of the oil to make sure the chicken doesn't burn. Place the chicken on a baking sheet and continue frying the rest of the chicken. When all the chicken has been fried, remove the wings and legs to a plate and keep covered. These should be cooked all the way through by now but always check, if any pink juice or meat is visible. If so, return to the hot oil for another minute or so until fully cooked. Leave the thighs and breasts on the baking sheet. Bake the thighs and breasts for 15 minutes to finish the cooking process. Sometimes I'll cut into the thicker part of one of the larger pieces, just to make sure the chicken is cooked through. If any pink juice or meat is visible, the chicken needs to continue cooking in the oven. If you have no desire to cut up a whole chicken, by all means have your butcher do it, or just purchase chicken pieces. I like just the legs and thighs, so that's what I bought. Simple! I had originally planned to add hot sauce to the buttermilk (since I know that's also a classic thing to do when marinating the chicken), but I figured I didn't need to do that since the flour was already seasoned really well. But if you'd like to add the hot sauce, go for it! Here's another fabulous zucchini recipe that thinks just slightly outside the box. Yes, you can saute zucchini with olive oil and garlic, you can make zucchini bread, and you can make zucchini pancakes. But did you ever think of using zucchini instead of crab? I first heard of this from my brother, Dennis. As soon as he mentioned it, I began looking for just the right recipe. Well, of course, there are a million versions, and every one of them claims to be THE BEST. Clearly, the only way to settle this would be to come up with my own version! So I looked at a few different recipes, kept what I liked, changed what I didn't like, combined a few things, omitted a few others, and this was the result! Now, I'd be lying if I said they taste JUST like lump crab Maryland Crab Cakes. But, ya know what? They tasted pretty darned good! I'd definitely say they're better than you're standard grocery brand of frozen crab cakes. They're just the right texture, and between the mayonnaise, the Dijon and the Old Bay, they really do taste like crab cakes. Plus, you get to adjust the seasoning to suit your own taste. and that's always a good thing. So give these a try. I betcha you'll love 'em, especially if you're usually not able to eat crab or other shellfish! They're awesome! Sprinkle grated zucchini with a tsp of salt. Place in colander and allow to drain for at least 30 minutes. Place zucchini in the center of a clean kitchen towel. Gather the corners together and twist the bundle so that it tightens around the zucchini, squeezing out as much moisture as possible. You will absolutely be amazed at how much liquid comes out of the zucchini! Place the zucchini in a large bowl along with seasoned bread crumbs. Toss to combine. In a separate small bowl, stir together the egg, butter, onion, Old Bay, mayonnaise, and mustard. Stir egg mixture into the zucchini. Season with salt and pepper and give it another good stir. Form into 6 patties. Place Panko bread crumbs in a shallow dish. Dredge each cake in the crumbs being sure it is coated on all sides. Heat oil in a large skillet. Fry the cakes in the oil (in batches if you need to) until golden, about 4-5 minutes on each side. Serve immediately! These cakes go beautifully with tartar or cocktail sauce, just as with regular crab cakes. To make home made tartar sauce, simply mix a few tbs mayonnaise with a tbs or two of pickle relish. Easy! Yes, I know I have two different kinds of bread crumbs listed. The seasoned bread crumbs add great flavor and bulk to the mixture and the Panko bread crumbs give you a crispy outside crust! Yes, you can clearly use one or the other for both parts of the recipe. No worries!